X-ray of Brain Damage caused by Amphetamines. Brand names of medications that contain or metabolize into amphetamine include Ritalin, Adderall, Adderall XR, Dexedrine, Dextrostat, Concerta, Focalin and Vyvanse.They They are listed as Schedule II drugs, with a high potential for abuse. Some examples of Schedule II drugs are: cocaine, methamphetamine, methadone, hydromorphone (Dilaudid), meperidine (Demerol), oxycodone (OxyContin), fentanyl, Dexedrine, Adderall, and Ritalin. There is irrefutable evidence that amphetamines can and do cause brain damage. 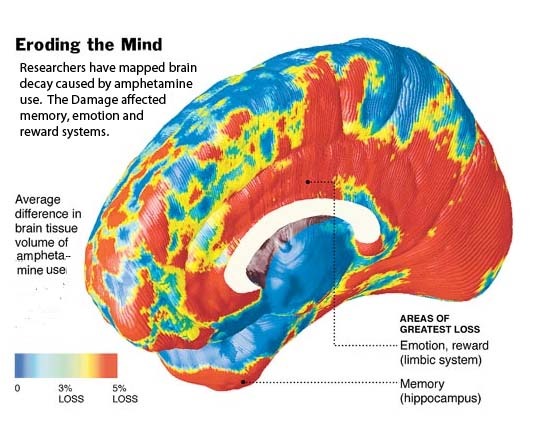 Evidence of brain damage can be seen on MRI scans as shown in the photo to the right. Both Adderall and Ritalin are both drugs containing amphetamines. Regardless of the reason for taking amphetamines, uses can undergo similar brain chemical changes to patients suffering from Alzheimer's Disease and stroke. Usually this kind of nurological damage take place when taking a high dose, although damage has been known to occur while taking a much lower dosage. Psychostimulants, act on the central nervous system and heartbeat. Children initially are reported to have less hyperactivity and increased ability to focus and concentrate. As the child becomes more use to medication, he requires higher and higher doses to produce the same effect, as what normally occurs with amphetamine users. After several months, the medication often "stops working" and then other ADHD medications are ordered by the doctor. This may include the child developing hand tremors and motor tics. Shire Corporation has noted that there is significant evidence that amphetamines can cause damage to the brain's neurons - the cells which are used for thinking. Both Adderall and Adderall XR have been found to be neurotoxic in laboratory rats particulary in the higher does. No one as yet has done a study on the long term neurotoxic effects on children, according to the FDA. There is evidence that significant neurological changes and side effect can and do occur while taking Adderall or another stimulant medication that is chemically similiar or derived from amphetamines. "Acute, sustained chorea in children after supratherapeutic dosing of amphetamine-derived medications. Ford JB, Albertson TE, Owen KP, Sutter ME, McKinney WB. Pediatr Neurol. 2012 Sep;47(3):216-8. doi: 10.1016/j.pediatrneurol.2012.05.013. [PubMed - indexed for MEDLINE]"
Amphetamine users have reduced concentrations of a chemical called N-acetyl-aspartate, which is a byproduct of the way neurons work. Research carried out in Torrance, California, and reported in the journal "Neurology", compared the brains of 26 previous methamphetamine users with 24 non-users. They found at least 5% lower concentrations of N-acetyl-aspartate in two key areas of the brain, the basal ganglia and frontal white matter. 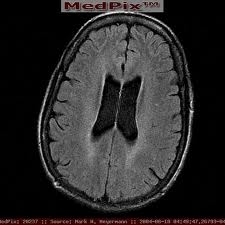 Dr Thomas Ernst, who led the project, said: "Many brain diseases associated with brain cell or neuronal damage or loss, such as Alzheimer's disease and other dementia, epilepsy, multiple sclerosis, brain tumors, stroke and HIV brain diseases, consistently have shown decreased N-acetyl-aspartate.